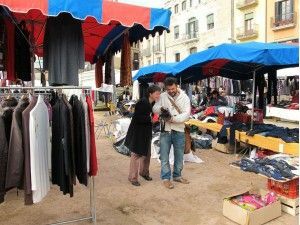 During the months of October, November and December 2011 within ACVIC'S programme, a workshop on documentary creation was developed at Mercat de la Plaça Major de Vic as a meeting place and the nerve centre for commercial exchange in the city. There, work was done on the practise of documentary-making, starting with strategies of research, narrative and editing, applying an anthropological vision. With all the documentary material recorded for the duration of the workshop, a documentary production A Mercat! Is now under proposal, which will present the different stories, people and products from the Vic Market, by means of, or through which, several educational activities will be developed. Director. He is a documentary maker, audiovisual teacher, freelance editor and cameraman. He has a degree in Audiovisual Communication at the Pompeu Fabra University, and since 2004 has directed and coordinated educational documentary projects for universities, colleges and art centres in Barcelona, ​​Granada, Portugal, Estonia, Nicaragua, and Mozambique. He made ​​the documentary "Va de Bòlit "for Bòlit, Centre d’Art Contemporani de Girona, and is currently developing the documentary project" Girona.mov " at the Centre Cultural la Mercè de Girona in collaboration with the Museum of Cinema. He conducts youth documentary workshops at the Font de la Polvora and Salt neighbourhoods. His works have been shown at national and international festivals, and he has received the award for best documentary at the Notodofilmfest '09 for "Balthasar". Education Coordinator and archivist. Actress / performer and theatre director. Graduated in interpretation at the Theaterschool Amsterdam in 1988. Achieved her Master of Arts in Theatre Direction at Dasarts (Amsterdamse School Of Advanced Research in Theatre and dance studies) . She has lived in Catalonia since 2000. In addition to creating her own work since 1988, she has worked with directors and theatre and dance companies in the Netherlands, Belgium and Spain. In Spain she participated as a performer in the shows Como Casas by Ernesto Collado, Freaks by Ferran Audi, Prestidigitaccions by Jordi Cortes, Testimoni de Llops by Mal Pelo, Lazaro by Ernesto Collado, among others. As assistant director, she participates in the Jukebox shows by Jordi Casanovas and Menta in iurmain by Monica Muntaner. She teaches acting classes at the Municipal School of Dance in Celrà. Since 2009, she has been working with the council of Sant Hipolit de Voltregà supporting the Area of Culture and Youth. In the Netherlands, she participates in several intercultural / interdisciplinary projects in centres for political refugees. He has given seminars at the Grup d’Estudis en Cultura i Societat at the UOC (http://culturaisocietat.wordpress.com/seminaris/) and has participated in several collective works and journals with papers on design and communication, among the most notable of which are: “Producción semiótica y significatización de la economía (O ¿cómo lograr una publicidad efectiva en la era del capitalismo virtual? )”, in the magazine Pensar la Publicidad (UCM), “Diseño y comunicación. Construyendo identidades mediante experiencias”, at VVAA.